February 2014, Yangon – Her Royal Highness Crown Princess Mary of Denmark and The Minister for Development Cooperation of Denmark, HE Mr. Rasmus Petersen and their delegations stayed at Chatrium Hotel Royal Lake Yangon during Her latest charity project with the United Nations Population Fund (UNFPA) in Myanmar. HRH Princess Mary of Denmark serves as UNFPA Patron and supports the agency’s works to promote maternal health and safer motherhood across the world. 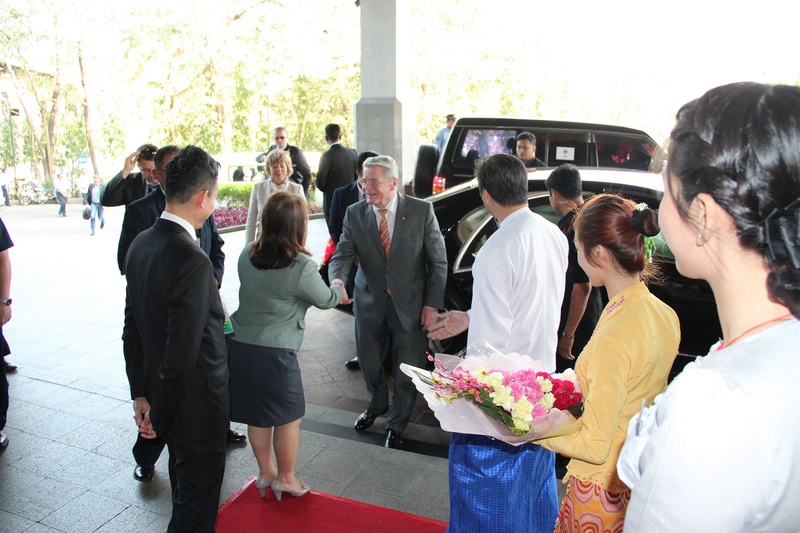 Chatrium Hotel Royal LakeYangon also was honored to have President of Germany, HE Dr. Joachim Gauck and his delegations stayed with us while they were attending the first Myanmar-Germany Business Forum in Yangon. On this occasion, President Joachim Gauck met President Thein Sein and Nobel Peace Prize laureate Aung San Suu Kyi. President Joachim Gauck also hosted a dinner at Chatrium Hotel Royal Lake Yangon. Photo shows: General Manager of Chatrium Royal Lake Yangon, Ms. May Myat Mon Win, (2nd left) recently welcomed and President of Germany, HE Dr. Joachim Gauck upon his arrival at the hotel during his official visit to the Republic of the Union of Myanmar recently. About Chatrium Hotel Royal Lake Yangon: Chatrium Hotel Royal Lake Yangon is part of Chatrium Hotels & Residences luxury hotel collection and is one of the city’s topmost hotels for pure luxury and rich colonial-style architecture. It is situated among lush greenery and beside the famous Kandawgyi Lake; providing simply stunning and spectacular views of Shwedagon. Every guestroom is spaciously designed and influenced by local area’s culture with some touch of oriental heritage. The Royal Lake Suite, the premier suite of Chatrium Hotel Royal Lake Yangon, accommodated many Celebrities and Heads of State who visited Yangon and stayed at the hotel. The Royal Lake Suite located on the top floor, is beautifully decorated in colonial style luxury. The 300 sq.m. suite offers opulent yet comfortable spaces for living, dining and includes a private balcony which showcases sweeping panoramic views of the Shwedagon Pagoda and Kandawgyi Lake. Discover our 5-star services at Chatrium Hotels & Residences in Bangkok and Yangon. Visit us at www.chatrium.com. Or www.facebook.com/Chatrium.